They feed on the roots of the turf and are difficult to control. Birds will often tear up grass trying to eat the grub. Timings Spring / Summer. Chafer Grubs are dormant during colder months. What are Chafer Grubs and Leather Jackets? Chafer Grubs are the larval stage of the Chafer Beetle of which there are several different types. The most common in the UK are the Garden Chafer and the Welsh Chafer which is found in areas outside Wales. Chafer Grubs are very easily recognised with white/cream bodies with a brown head and 6 brown legs and they are usually curled into a C shape in the soil under turf and at about 1-2 inches in length. Often it is the Chafer Beetle that is seen first, as they swarm over your lawn or garden.The female beetle will burrow down into the ground and lays eggs near plants in summer, and the larvae hatch out a few weeks later. They will then pupate over Winter and hatch as adults in late Spring. Chafer Grubs will feed on the roots of turf in all situations such as lawns, golf courses, race courses and airports and while a background population of them can be sustained in well fed turf, if the grass is under stress from adverse weather conditions or some other environmental factor, then this can have a detrimental effect on it. In some cases there can be up to 100 in one square metre. 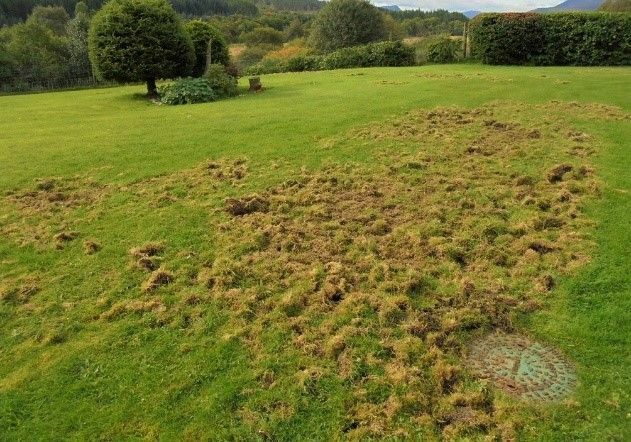 The most common sign of a minor problem with Chafer Grubs is brown patches of grass and when you look closer, this brown grass can be pulled up easily because the grubs have eaten the roots. This should not be confused with droughted grass that has gone brown and this will not pull up as the roots are still in the ground. If the issue becomes worse, then the damage that occurs is more from secondary predators of the grubs such as crows, badgers, foxes and other birds and mammals. These animals will rip up or peck through it in order to get to the grubs underneath and then eat them.